Hi, I have just purchased a BELL TELEPHONE VINTAGE M.F.G Company, Belgique..From around the 1950s. I’m able to accept incoming calls with it, but I’m having problems dialing out. It works sometimes but not all the time as the dial appears to be sticking/ slow movement. It’s an intermittent problem, it will work when dialing a number then it won’t. I’m in the UK and need some help/ advice…What kind of brand name of oil would you recommend as I have been looking for this ‘silicone free’ kind of oil that you have mentioned but can’t seem to find anything when I ‘google’ it… And how much would it cost to have this restored as I’m in the UK and don’t use euros…Where are you based, or is there anywhere local ie in the UK that you can refer me to…Thanks in advance Barry. Hi Barry, thank you for your comment. BTMC used a number of dial designs and I am not quite sure which one you have there. The erratic behaviour of your dail my very well be caused by dirt or the dial speed is just a little out of spec. In any case, some cleaning will be needed. I am not sure which brands are available in the UK but a good quality sewing machine oil will be good for oiling a dial. An example of a lubricant with sillicone is waterproof bike chain oil. I do not recommend that for dials. I am based in the Netherlands. I can of course refurb your dial, but shipping costs to and fro will set you back at least 30 e.
I will send you this reply by email too. I suggest you send me a picture of your dial, so I can at least give you some pointers for cleaning it. Hello, when you disassemble all that is behind the dial, regarding the spring, it is enough to go slowly by lifting it, to count the number of turn that will do by releasing it. Once cleaned, it’s simple, you count the same number of laps that it did by releasing it and you put everything back in place correctly. This should be enough once everything is cleaned up. I never had a problem with my dial phones . Hi Yuri, thanks for sharing your view on this matter. Please mind that this article is about a basic restoration, so I wanted to keep things simple and for the novice easy to do. Besides that, with many dial designs, especially older ones, it is impossible to remove the finger wheel without unwinding the spring. In the future I intend to publish more article on this matter, like articles on specific dial designs, how to calibrate a dial without a dial measuring instrument, and how to do full restorations of dials. Hello I am trying to change a telephone dial card in a rotary phone for use in a production of ‘Dial M for Murder’ The phone we have in the props cupboard has a slightly broken plastic cover of the dial card and consequently I can’t see the hole to help remove the face. Do you have any suggestions? I have photos I can send you. Hi Asha, thanks for your message. I also received your email with the pictures. 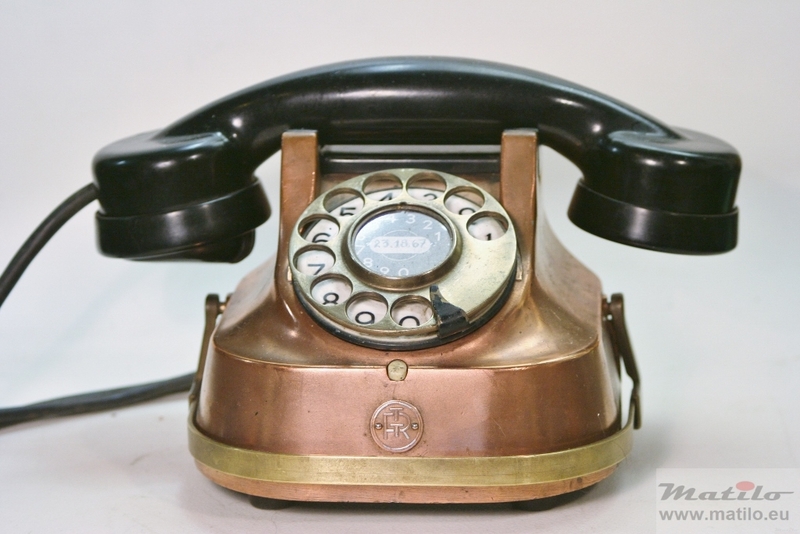 Your telephone is a GPO 700 and does not have the pin hole release, like US telephones. Here is a link to a video that shows how to replace your dial label. I have a Bell System/Western Electric C/D 500 12/53 rotary phone that gets dial tone but I cannot dial out. Fixable? Any suggestions? Hi Susan, a 500 C/d should work on a normal telephone line. Perhaps your telephone line does not support Rotary dials and only touch tone? It is a common problem. Arwin, thank you for your response. Other rotary phones on that same line work fine. It’s just this rotary phone that does not work. I can get dial tone with this phone, but the dialing does not work. Again, thank you for your response! I await your comment! Hi Susan, either the telephone is wired wrong or the dial does not run at the right speed and needs adjusting. The first problem is hard to solve, via this medium. The possibilities are endles. The 2nd problem is easy to test. You can help the dial along with your finger, on the return stroke, making it run a little faster. Or you can hold it back a little with your finger on the return stroke, making it run a little slower. If you do this dialing 2 or 3 and it breaks tone, you know it is running too slow or too fast. Thank you for your response. The phone jack at the location where I would like the black rotary to be placed is currently a white rotary phone (which works, by the way). I tried the black phone on another rotary-accepted phone jack and I run into the same problem as above. Get dial tone, but cannot dial the phone. To me it seems like something’s askew with the rotary itself. Are there websites (yours perhaps) where I can get instructions on how to look inside the phone and make sure it is working/connected correctly? P.S. I it normal to have only three of the four colored wires? Red, yellow & green and not black? Could that be the problem? Many ex-BT engineers are on the Facebook page GPO Telephones and will be willing to offer advice for the phones they used to work on. In the past, we used to change the dial if we thought it would be quicker than trying to work on a dial at the customer’s house or office. Hi Anne, what spring loaded screw do you mean? The one that secures the body shell to the base? You can just put the spring over the screw, push it through the hole and put the nut back on. You may need a tool to hold the nut. 1) How do I loose the finger wheel to align it with the numbers? I have to unscrew that hexagonal central piece? With which tool? that “discharge” (once) if the hook goes up. Don’t know If I made it clear, sorry. Any tip please? Thanks in advance! Hi Fabricio, thank you for your message. 1 Yes, unscrew the hexagonal nut. There may be a little play on the fingerwheel. Also, you may want to check if the number ring is positioned correctly. If that does not work, on the back the mechanism is mounted on a metal plate which is fastenend to a plastic disc with 2 bolts. If you undo those you can move the mechanism a little. 2 is there a diode in the handset? This should prevent loud clicking. I just got a RTT56A, looking like the one one your site (http://www.matilo.eu/wp-content/uploads/2015/11/RTT-56-Copper.jpg). Most of the time the rotary wheel runs ok but sometimes it returns slow or gets stuck when I pull out my finger. I guess it needs some cleaning so I was wondering if I can remove the finger wheel without worrying about unwinding of that spring you mentioned. Is this also the case for this model? I saw the finger wheel is attached with a single screw but don’t want to unscrew it and find myself in trouble. Hi André, I would leave the finger wheel in place, if I were you. Just clean the back of the mechanism, as described above. That should improve the performance of the dial in any case. Ok, will do. Thanks for the advice and great site! I have an old W49 and have a problem with the dialing. All number dial expect the 3 and the 6. Could you give me an idea as to what I can do. Hi Kevin, this could have a number of causes. First make sure you dial mechanism is clean and oiled, as explained in the article. Have you done that yet? The particular dial on the W49 is an NrS38, the same as in the article. Make sure the fingerstop is not bent. Often a bent fingerstop inhibits the proper turning of the finger wheel. Turn the dial on it’s side and look through the fingerstop. Give the dial a full turn and check if the fingerwheel does not touch the stop. Do the 3 and 6 misdial? Always or just sometimes? How do you know it is the 3 and 6?